Elliott Sharp can be a real noisemaker. The guitarist has teamed with dwellers of outer cosmic space to create some extremely dissonant, in-your-face music. Call it experimental or avant-garde if you like… the man has excellent command of his instrument, but he can be hard to follow. 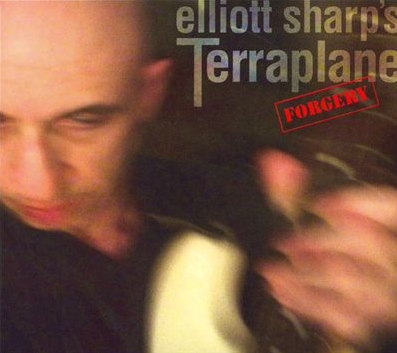 Up until I heard Sharp’s original Terraplane (Homestead, 1994), I had no clue that he could also play the blues. With his electric power trio, the original Terraplane incarnation, he blew through the generations, sliding like Robert Johnson in his kitchen, doing the Texas blues shuffle a la Stevie Ray Vaughan, and so forth. Sharp has an encyclopedic understanding of the blues guitar, including its voice-like phrasing, its elastic intonation, its tension and release, and the all important “cry”. He approaches improvisation from a jazz perspective without making the exercise the least bit academic. Four years after a similar 1996 duet record with vocalist Queen Esther, Sharp had assembled a real band with horns and vocals, called it Terraplane, and gotten it on disc. This, the group’s fifth recording, features a new reincarnation of the band and finds Sharp back in rougher territory. It was easy to sit back and enjoy that first disc, but you often have to pay attention to Forgery in order to enjoy it properly. Maybe that represents a return to roots for E#. To his credit, Sharp’s assembled a crack band of indie all-stars who all know how to make the action happen, and they fit together intuitively. Improvisation has spread the original frontman concept all around. Oddly enough, Sharp’s guitar often sounds too low in the mix for me, but I guess that’s one way of drawing attention to the rest of the group. Curtis Fowlkes (trombone) and Alex Harding (baritone sax) step in regularly and provide some of the most gut-wrenching playing on the record. To call this a blues record would be an understatement. Sharp’s got plenty of the aforementioned blues chops, and his guitar is a rallying point for the group, but he’s evolved to the point where every player gets to say something personal—a big change from the lock-step “double trouble” rhythm section on his first blues disc. So much of this music is interactive and improvised that Forgery crosses the line into jazz territory. But blues and jazz have been a happy couple more or less since the beginning, and they are exactly that on this disc. The music acquires some of its greatest color through vocal contributions on seven of 11 tracks. Two returning band members, Tracie Morris and Eric Mingus, sing on one and six tracks respectively. Sharp himself also makes a low-key cameo with Fowlkes and Harding. Morris sounds warm and relaxed, sultry and legato, appropriately enough for lyrics like “music is happy, no matter what” on track three. Mingus is no crooner: he’s rough, raw, and in your face. The Hendrix edge on “Dance 4 Lance” is uncanny, for example. The rough, melancholic, soulful, rambunctious, and misbegotten qualities of the blues shine through on Forgery. The group is very much a band, with plenty of back-and-forth all along. I can’t say I got much out of the vocalists, at least in part due to personal taste. The instrumental tracks are all longer and seem more sophisticated, taking the song form concept much more freely. And that befits the title, illuminated in the liner notes with 12 correct proper definitions as verb or noun—relating to pig iron, repeatedblows, advancement, hydraulic presses, and, yes, that counterfeit thing. Irony has always been one of Sharp’s distinctive features, whether on the page or on disc.